Perched along the southwest coast of Africa, Angola is a country that had conjured up images of a decades-long civil war, and a nation struggling with the aftermath of its role as a pawn of the Cold War powers. Recently however, Angola has made headlines for its breathtaking pace of growth due to its wealth of natural resources, most notably its plentiful oil and gas reserves. In a short span of time, powerful growth has propelled Angola into one of Africa’s most dynamic economies and its second largest oil exporter. The country’s frenetic capital city, Luanda, regularly competes with Tokyo and London as one of the most expensive cities in the world for expatriates. Yet serious inequalities and challenges remain on the ground, including low educational attainment levels and deficiencies within the education system. Clearly, Angola is a study in contradictions. Beyond these headlines, Angola is also a country of great opportunity. Recent reforms to its education sector, the country’s focus on education as a path to development, and the urgent need for technical skills and training – including English-language training – have opened doors to a range of potential collaborative partnerships with education institutions, industry, governments, and private providers around the world. 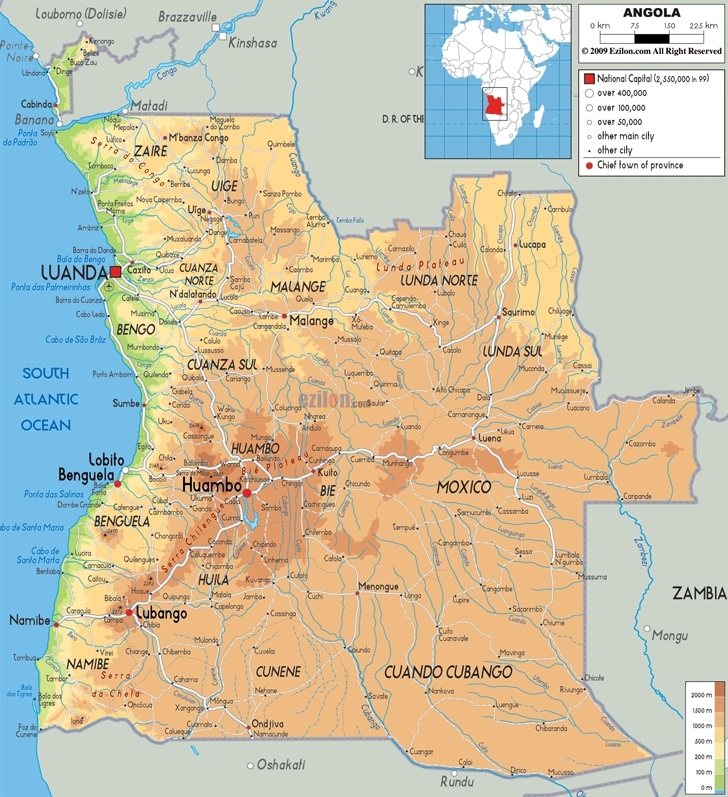 Angola is a former Portuguese colony. In earlier centuries, the land now called Angola played a key role in the Portuguese slave trade with another distant colony, Brazil. Angolans fought a fierce 14-year war of independence with Portugal that ended with the country winning its independence in 1975. Major players in these movements were the MPLA (Movement for the Liberation of Angola, part of the Marxist Party) as well as the National Front for the Liberation of Angola. Following independence, rival factions plunged the country into a bloody civil war. Despite free, multi-party, UN-monitored elections in 1992, the country remained mired in conflict until the demobilisation of armed forces in 2002. Free elections were held again in 2008, with José Eduardo dos Santos, President since 1979, re-elected. The constitution was updated by Parliament in 2010, strengthening the Presidency and abolishing direct elections for the post. In the past decade, buoyed by rising oil prices, the economy has taken off and major investments in infrastructure and other projects have pressed ahead. The government has worked to re-integrate former fighters and to repatriate refugees who fled the country during the war. In May of 2014, the country held its first general population and housing census since their national independence. According to an article in Tanzania Daily News posted on the All Africa website, results indicate that the country has 24.3 million people, of whom 52% are women. A full 60% of Angolans are under the age of 25. Much of Angola’s astonishing growth is owed to its booming oil sector. A recent article in The Economist notes that crude production increased from 800,000 barrels a day (b/d) in 2003 to almost 2 million b/d in 2008. During that same period, the economy, which had been in a shambles following the civil war, grew by more than 10% a year. Today, The Economist notes, Angola’s GDP is the fifth-biggest in Africa, with glitzy skyscrapers and luxury shopping malls popping up around Luanda. The government, for its part, is spending billions of dollars on roads, railways, airports, and energy projects. According to the BBC, in 2012, Angola launched a US$5 billion sovereign wealth fund to channel the country’s oil wealth into investment projects. The Economist, however, strikes a note of caution. The global economic downtown of 2009 and 2010 hit Angola hard, and oil output has been stagnant since then. With a staggering 97% of its exports and 80% of state revenues dependent on oil, the country remains highly vulnerable to oil shocks and declining prices. Angola’s GDP grew by only 5.1% in 2013, well below expectations. Growth, however, is projected to reach 7.9% in 2014 and 8.8% in 2015 as major public infrastructure investments kick in. While the oil sector is vulnerable to global commodity prices, some parts of the non-oil sector are thriving. Banking, telecoms, construction, drinks and retail industries are doing well, buoyed the rise of a small but growing middle class. Prices for certain luxury goods are beginning to come down. At the same time, Angola can be a difficult place for investors and entrepreneurs. The Economist highlights The World Bank’s “ease of doing business” survey which ranked Angola 179th out of 189 countries. Enforcing contracts, difficulties getting visas, and a dire shortage of electricity are all challenges noted by the World Bank report. Perhaps one of the most persistent and pressing issues faced by the country is the high degree of inequality among its people. A full 54% of Angolans survive on less than US$1.25 per day. According to basic UNICEF indicators, infant mortality rates, while improving in the past decade, remain staggeringly high, and life expectancy for the average Angolan in 2012 was only 51.5 years. The quality of life for people in rural areas and slums has barely improved since 2002. It’s not surprising that the Angolan government is banking on education, in particular vocational and technical education, to help lift more of its people out of poverty and address some of its most pressing development needs. UNICEF statistics note that between 2008–2012, the net enrolment ratio of boys in secondary education was only 14.9%, and for girls only 12.1%. The number of mean years of education among Angolan adults is only 4.4 years. The Angolan education system has been under reform since 2004. New education levels have been introduced, the student evaluation system has been changed, and curricula reformulated. According to a report on Angola by UK Trade & Investment, the country now has a unified system consisting of seven subsystems (pre-school education, general education, technical and vocational education, teacher training, adult education, higher education) structured under three levels (primary, secondary, and higher education). Primary education in Angola lasts for six years and is free and compulsory, though a shortage of schools and teachers makes the law difficult to enforce. This is a challenge throughout Africa, flagged by the 2012 Education For All (EFA) monitoring report that notes that African countries must recruit over two million teachers to achieve universal primary education by 2015. The secondary education system is divided into two cycles of three years each. There is a parallel technical education system divided into three years of vocational education and four years of middle technical education. University education is offered only in major urban centres, with tuition fees high compared to nearby Namibia and South Africa. Quality concerns have also been an issue. The OSISA report outlines the development of a National Qualifications Framework (NQF) among several southern African countries in recent years, following South Africa’s example. Angola is exploring the possibility of its own NQF. Proper evaluation of Angolan teachers and the Angola system is hampered by lack of quantitative data and evaluation expertise. Another report on the education system, Country Report on Policies and Mechanisms for Integration into the Workforce and Job Creation, highlights the urgent need for technical and skills development among Angolans, particularly in the Technical, Vocational, Education and Training (TVET) sector. Post-conflict, there has been a need to re-integrate former soldiers and re-educate an entire generation excluded from skills and training due to war. The report notes that high school students have exhibited a strong preference for technical training over general schooling. Unlike in other countries, technical training in Angola is seen as a path to university (engineering and sciences) rather than directly into the labour force. Between 2005–2007, Angola undertook a major three-year plan to develop technical education, involving the construction of 34 new technical institutes with Chinese funds. TVET curricula were also updated during this period. Part of the push to develop greater capacity for TVET graduates is the government’s strategic aim to “Angolise” the oil sector and other key industries by training skilled Angolan graduates. A Chatham House report, Education in Angola: Partnership Opportunities for the UK, highlights the social and developmental focus of the Angolan Development Bank (Banco de Desenvolvimento do Angola), or BDA, a body which finances activities that contribute to the socio-economic development and diversification of the Angolan economy. While the report suggests the BDA initially needs basic skills training for its own ranks (in project management, IT, communication and other basic skills), the Bank will also require technical assistance for more specialised skills and qualifications such as in engineering, geosciences and agronomy – skills and training that cannot currently be met by Angola’s own universities. The urgent need for skills and training comes with many challenges, but also many opportunities. The Chatham House report flags human resource development as a way to further the “Angolisation” of the oil and gas sector as one potential partnership. An Angolan certification authority to guarantee quality in training and education and offer certification and accreditation is also desperately needed. The emerging agriculture sector is in need of agri-business skills. Many of these same market reports for Angola raise flags regarding potential challenges as well. For example, that most training, other than ELT, will have to be conducted in Portuguese, especially for health and safety-related courses. Teaching materials – including for ELT – would need to be adapted for the Angolan market. Some training programmes – even if the quality of training and education in Angola is enhanced – will need to be run abroad. International House is one prominent English school that has experienced this mix of opportunities and challenges firsthand. International House (ih) Cape Town opened a branch school in Luanda in March of this year, and the school has provided courses in the months since, including corporate training programmes and a counselling desk for Angolan students planning for further studies abroad. Gavin Eyre of ih Cape Town notes that a growing demand for English skills in business and education is driving demand in Angola. “The level of English is generally very low,” he adds. “That’s really what led us to open ih Luanda. Many students need to improve their English skills to pursue further studies in Angola or abroad, or to pursue their careers. As we reported earlier this year, a recent UNESCO study highlights the growth in student mobility and the surging demand for higher education among students in sub-Saharan Africa. Seismic demographic shifts, like those witnessed in Angola, have fuelled a growing middle class willing and able to travel further afield in search of quality university education. While the report notes that the gross outbound enrolment rate for tertiary education remains low in Angola compared to its neighbours in the Southern African Development Community (SADC), the most recent UNESCO statistics indicate that 7,534 Angola students are now globally mobile. Perhaps unsurprisingly, given Angola’s colonial past, the top two study destinations are Portugal (1,679) and Brazil (1,552), with South Africa (1,167), the United States (755), and Cuba (566) rounding out the top five study destinations. Chatham House notes a limited number of informal cooperation agreements between universities in Angola and those in the UK, mainly for visiting lecturer or other ad hoc programmes. The University of Aberdeen, for example, which offers specialised courses on oil and gas, receives four to five students on scholarship from Sonangol, Angola’s state oil company. Despite its recent GDP dip, Angola remains poised for tremendous further growth in the years ahead. With a rising standard of living, a wealth of natural resources, and a young population in need of a range of education and training opportunities, Angola provides many possibilities for partnership, exchanges, collaboration, and investment at all levels of the education sector. While challenges remain – particularly raising basic education enrolment levels and tackling chronic poverty – Angola, blessed as it is with tremendous natural resources, is likely to continue to play a greater role in the years ahead in the African economy and with respect to student mobility within the continent and beyond. This entry was posted in Africa, Higher Education, K-12, Language Learning, Regions, Vocational and tagged colleges with international students, polytechnic, vocational schools abroad, teacher training, students from West Africa.